The band Cymande recorded their last album 41 years ago, but music fans have had plenty of chances to hear the group’s music over the past four decades. Of course, most of those fans probably didn’t know that they were listening to the British funk band. Rap artists and hip-hop producers helped ensure that music fans continued to hear Cymande’s music through sampling. “Dove,” a cut from Cymande’s 1972 debut album, has been sampled no fewer than 16 times, most notably by Wu-Tang on “Problems” and by The Fugees on the title track of their 1996 classic album, The Score (“Dove” was an appropriate name for that song, because the word Cymande is a Calypso derivative of the dove and symbolizes peace and love). Other hip-hop acts have sampled Cymande songs such as “Brothers on the Slide,” and “Bra,” and after reacquainting myself with “Dove” it’s easy to see why. “Dove” has a slow groove propelled by an insistent bass line, Afro-Caribbean percussion and a buzzing guitar solo that remains in the listener’s head. The principals who were the driving force behind the Cymande sound between 1971 and 1974 – mainly Steve Scipio (bass, vocals), Patrick Patterson (guitar, vocals), Sam Kelly (drums), Mike Rose (sax, flute, percussion), Pablo Gonzalez (percussion, vocals), Derrick Gibbs (sax), and producer John Schroeder - had been trying to work the logistics of reuniting back in 2012, and the group got back together in 2014 to tour, and they are now releasing the album A Simple Act of Faith, their first in 41 years. 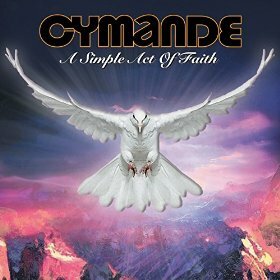 The 10 tracks on A Simple Act of Faith find Cymande returning to their trademark sound of funk infused with Afro-Caribbean sounds such as reggae and Calypso. Thematically, the record ranges freely from spiritual themes tunes such as “Everybody Turn Rasta,” “No Weeping” and “God’s Highway” to the socially concerned “Crazy Game,” which is an anti-violence anthem. The largely instrumental “A Moment for Reflection” could fit in nicely at a stepper’s set while the title track is a tender and sensual ballad that describes a bedroom scene -- not in the explicit terms that are so often used in music, but rather in the spiritual way that exists when two people choose to totally trust. In that case, love is indeed a simple act of faith. “All or Nothing” is a mid-tempo funk number that features call and response choral styling, a jumping bass line, and flourishes of Afro-Caribbean styled brass, while “God’s Highway” sandwiches a percussive reggae beat between a pipe organ introduction and ending.